The "LG-ES" makes preparation for electrotherapy stimulation a breeze! Prepare and clean the treatment area and use your electrodes with our highly conductive, economical, multi-purpose electrolyte spray which provides the ideal skin preparation. Perfect for use with all our electrotherapy (TENS, EMS Units). It is also safe when applied to electrode sponges. The "LG-ES" spray is different from gel. It is much easier to use and does not create a mess. A little goes along way. 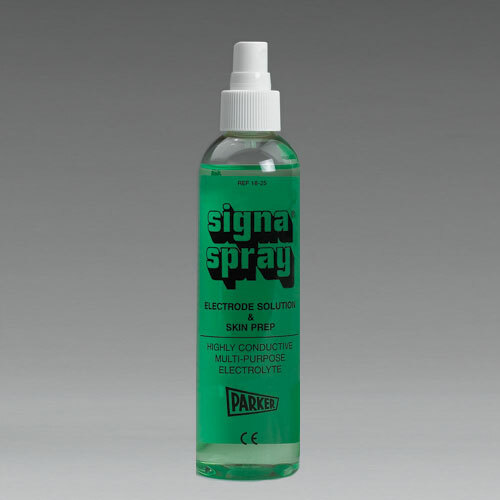 Using this spray helps prolong the life of your reuseable electrodes. The spray is not irritating to the skin like alcohol. Properly cleaning the area prior to use prolongs the life of your electrode pads. 5 I use this every time I use my unit. This stuff works great! 5 I use a little of the spray each time and it helps the longevity of the electrode pads and makes a great preparation for the skin..great product..